A thoughtful and comprehensive review by Alissa Wilkinson also has links to further reading. Gregory Alan Thornbury welcomes the opportunity it gives us to consider the dangerous question posed by the Bible. My friend Nathanael Smith encourages those of us with imagination and stamina to watch it. A non-Christian perspective is put well by Peter Bradshaw, who celebrates Crowe but laments the missing simplicity of the original story. Having read Noah Primeval by Brian Godawa, this wasn't the weirdest version of the story I've encountered. Half-way down this page there is a list of research articles about the original text - for level-headed people with too much time on their hands only. 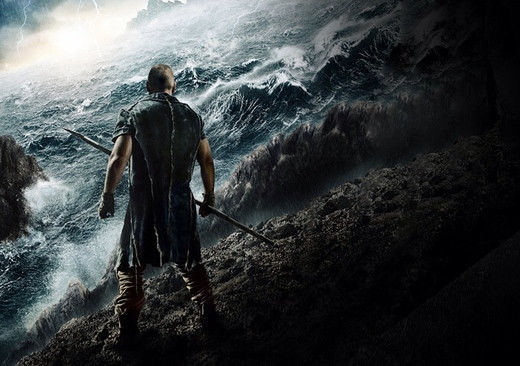 For my part, I thought that Noah was far more interesting than films with its size of special effects budget usually are. Seeing it as "midrash", an imaginative retelling, is the only way to approach it. From a Christian perspective, it was strong on the sinfulness of mankind, the cost to Noah of doing what he did, and in creating memorable visual moments. I thought it weak on God's communication with Noah and several other vital aspects of the big Bible story that it is a part of - but I would have been surprised if these had been dealt with successfully. It asks a lot of questions and doesn't give complete answers, which is probably the most I would want from a film like this. Less serious moments of disconnect included being reminded of the Transformers films by "The Watchers", and Ray Winstone being so indelibly associated with betting adverts that I half expected him to start calling the odds on rain falling. For any who go to see it, whatever you believe, I'd strongly encourage going back to the source material (Genesis 6-9) afterwards to see afresh what's really there and what that really tells us, and asks of us.